This Prapan Narkthong movie page contains 2 records. 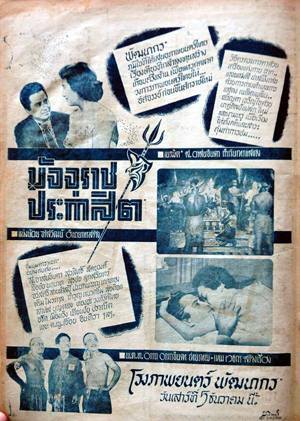 Thai movie มัจจุราชประกาสิต was released in year 1959. It is a lost movie in Thailand but a sequence of 26 minutes is still available. The sequence is still very colorful. It is an horror movie with a strange style. Main actor is Luechai Natnat and main actress is Prapan Narkthong. Directors are Sor Asanajinda and ครูเนรมิต. Actress จรัสศรี สายะศิลป์ also plays. It is a movie about hell mixing with human society. The god of death (ยมบาล) is played by Surasit Sattayawong. He sends to hell a wrong person (Luechai Natnat) so needs to bring him back to human world with additional power of being able to answer to various blessings. The human world being messy and deceitful (jealousy from women, lust), Luechai wishes to die again and be back to hell. 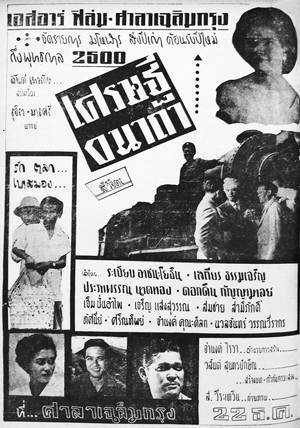 Poster advertisement mentions that the movie cost 0.5M Baht to be produced in 1959.